Keeping students engaged and motivated throughout their college experience is at the cornerstone of a WPI education. That engagement starts in the first year, beginning with opportunities to Get Connected in the months leading up to your arrival on campus, to New Student Orientation where you will meet upperclassmen, faculty, and staff and learn all about campus life, to immersion into our distinctive first year programs focused on a successful transition to college (in and out of the classroom), to initiation into university-level research and the project-based curriculum. Listen to student stories, connect on Facebook, set up your WPI accounts. Discover what you love best about WPI. WPI resources at your fingertips. 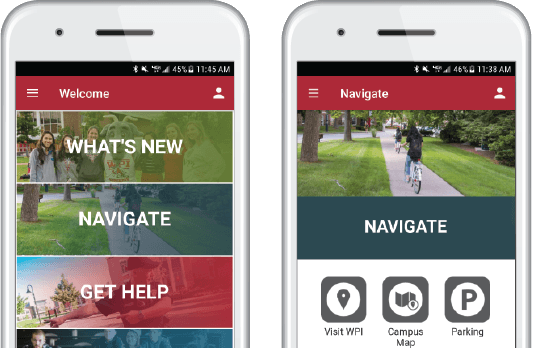 Download the WPI app and explore our interactive virtual tour — both providing expedient mobile access to campus services and information. Read the latest news. Be social. Learn more about the campus and nearby attractions. It’s all in the palm of your hand.  Download the WPI app.  Explore our Virtual Tour.